Open House Saturday 6/16 in The Bluffs on the Waterway! You are here: Home / Open House Saturday 6/16 in The Bluffs on the Waterway! 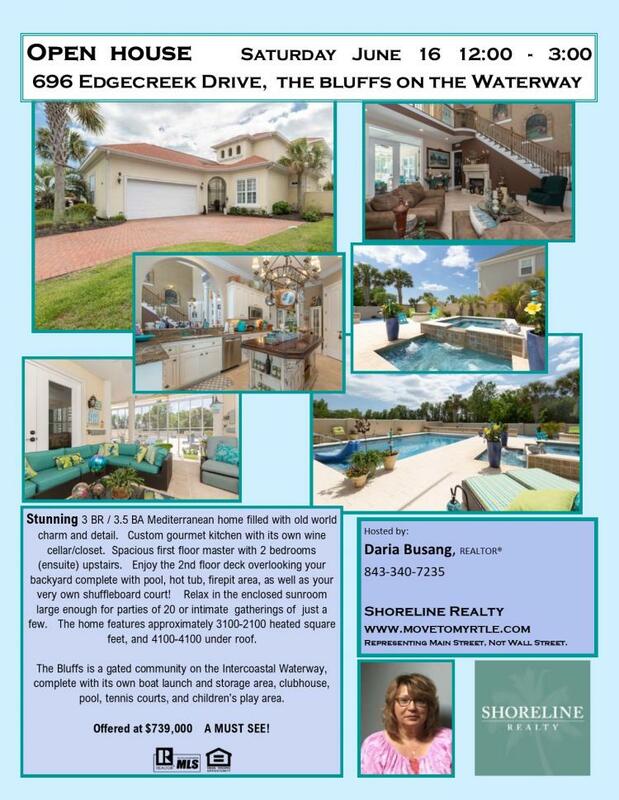 More About Open House Saturday 6/16 in The Bluffs on the Waterway! If you're looking for a gorgeous home in a prestigious gated neighborhood with it's own pool, hot tub, and shuffleboard court...look no further! Join me from 12 - 3 on Saturday June 16 and see this magnificent home for yourself. The home has 3 bedrooms and 3 1/2 baths, a gourmet kitchen, and so much more...including your own wine closet! Offered at $739,000. Call me for that day's gate code at 843-340-7235. Solve a Crisis When it Occurs. Thanks for stopping by! As a REALTOR®, I'm ready to help you find the solution to your real estate needs here in the Grand Strand. Whether you are considering a move to our area, thinking about selling or investing, or perhaps a renter who realized it's about time to stop throwing money away, my goal is to make your transition an easy one! I'm on your side and will fight for you 110% of the way!